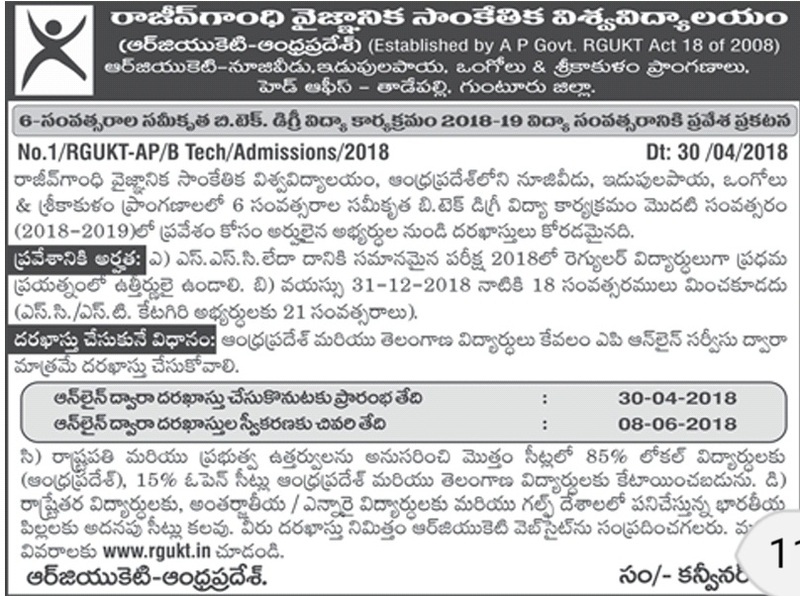 AP RGUKT IIIT Notification 2018, Andhra Pradesh IIIT Admission Notification 2018 announced for RGUKT IIIT Online applications for to Nuzvid, Ongole, Srikakulam and Idupulapaya. The candidates should apply through APOnline services only. The application fee should be paid in cash at APOnline service center, for which the center will issue a receipt. An additional amount of Rs. 25.00 per application should be paid as service charges to the APOnline Centre. If any candidate applies more than once, then the latest application will be considered for the selection process. Admissions to the first year of Integrated B.TechProgram (2018-19) will be based on merit in the Grade Point Average (GPA) and Grade obtained in each subject and by following the statutory reservations of the State. Admission to 85% of total available seats shall be reserved for ‘local candidates’(Andhra Pradesh) and the remaining 15% of the seats are open to the students of Andhra Pradesh and Telangana states as specified in the Presidential Order 371 Article D in consonance to Section 95 of the A.P. Reorganization Act, 2014. (see Annexure-1). The rules of reservation for different categories are as under in both local and unreserved categories, subject to any changes and amendments made by the Government of Andhra Pradesh. i. SC - 15%, ST - 6%, BC-A - 7%, BC-B - 10%, BC-C - 1%, BC-D - 7%, BC-E - 4%, Physically Handicapped (PH) - 3%, Children of Armed Personnel (CAP) - 2%, NCC -1% and Sports - 0.5%. A horizontal reservation of 33 1/3 % of seats in favor of women candidates in each category (OC/SC/ST/BC/Special Categories) shall be ensured, wherever women candidates are available. In case of PH candidates, certificates issued by the State Medical Board alone are acceptable. For Sports and CAP categories, certificates issued by the respective District Boards are acceptable. These reservations are applicable at state-level. Model proformas for certificates are given for all the above categories in Annexures. The applicants should submit a print out copy of the application along with the following documents at the time of certificate verification and Admission. The proforma for the certificates mentioned below are given in Annexures. GPA of 10th class Public Examination, i.e., SSC/CBSE/ICSE/NIOS. If a candidate fails to submit any of the relevant certificates, he/she shall not be considered for admission. The candidates selected provisionally for RGUKT shall report in person for Certificate Verification and Admissions at RGUKT campuses for verification of original certificates / documents and the details provided in the application form. 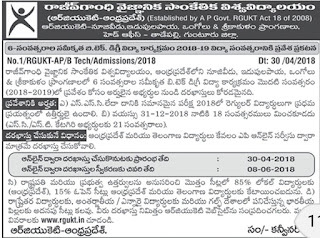 Verification of certificates and admissions in respect of candidates belonging to the Special Categories like Physically Handicapped (PH), Children of Armed Personnel (CAP), NCC and Sports will be conducted at RGUKT- Nuzvid on prescribed dates.